Hemlock is common name, particularly as used in the United States and Canada, for any of the coniferous trees comprising the genus Tsuga of the pine family, Pinaceae, characterized by small cones, and short, flat, needle-like leaves with two white lines underneath. This genus, with about nine extant species, is found in North America and Asia. The term also refers to wood of these trees. In addition, the name hemlock also is used as the common name for plants of the Conium genus of the parsley family, Apiaceae, and in particular Conium maculatum (poison hemlock). Conium maculatu is a common European herb that contains the alkaloid coniine and was probably the state poison of Ancient Greece, and the purported poison used in the execution of Socrates. The use of the term hemlock with respect to Conium maculatu is the more commonly understood meaning in a European and most historical contexts. Several other poisonous plants in the family Apiaceae (formerly Umbelliferae) are sometimes called hemlock, including water hemlock or cowbane. Water hemlock is any of four species comprising the genus Cicuta, a group of very highly poisonous flowering plants native to temperate regions of the Northern Hemisphere, mainly North America. Although water hemlock bears a superficial resemblance to poison hemlock (Conium genus)—and is a member of the same family—the species are distinct. Another plant with the name hemlock is hemlock water dropwort (Oenanthe crocota), a species in the related genus Oenanthe. Hemlocks of the Tsuga genus are very important as timber plants and for aesthetic and shade purposes. 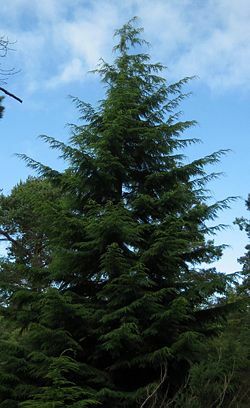 The western hemlock, Tsuga heterophylla, is particularly valued for its wood and the common hemlock, T. canadensis, is used often for ornamental purposes. Tsuga species also serve as food and habitat for many animals. However, even the poisonous hemlock of the Conium genus, which is deadly to humans and livestock, has ecological value as a food plant for various insects. Furthermore, it has been used medicinally by humans, for its sedative and antispasmodic properties, although such use is limited because of the slight difference between a therapeutic and a toxic amount. Note: Some botanists treat T. forrestii as a variety of T. chinensis. Tsuga is a genus of conifers in the family Pinaceae. They are commonly referred to as hemlocks. All of the species are evergreen trees that range in height from 20 to 60 meters tall and are found exclusively in relatively moist areas with little or no water stress. There are between 8 and 10 species within the genus depending on the authority, with 4 occurring in North America and four to six inches East Asia. Many species are utilized in horticulture and numerous cultivars have been developed. The wood obtained from hemlocks is important in the timber industry, especially for use as wood pulp, and several species are important as ornamental trees. The western hemlock, Tsuga heterophylla, is particularly valued for its wood. It is the largest species, reaching heights of 70 meters, and is a particularly common timber tree in the Pacific Northwest of North America. The tree is also planted for timber in northwest Europe and other temperate areas with high rainfall and cool summers. The common hemlock or eastern hemlock, T. canadensis, which is found in eastern North America, including in the Great Lakes and Appalachian regions, is used often for ornamental purposes. Its hard, strong, and yet soft and light wood also is used in construction and to make boxes and paper pulp. The populations of two eastern North American species, namely T. canadensis and T. caroliniana (Carolina hemlock,, found in southern Appalachians), are currently being rapidly reduced by a sap-sucking insect accidentally introduced from Asia called the hemlock woolly adelgid, or Adelges tsugae. Extensive mortality has occurred, particularly east of the Appalachian Mountains. While this bug does not seriously affect the hemlocks in its native range, nor the two western North American species, it is unchecked by both resistance and predators in the eastern United States. Tsuga species are used as food plants by the larvae of some Lepidoptera species including autumnal moth and the engrailed, and older caterpillars of the gypsy moth. The common name hemlock is derived from a perceived similarity in the smell of the crushed foliage to that of the unrelated herb poison hemlock. Unlike the herb, the species of Tsuga are not poisonous. Hemlocks (genus Tsuga) are a member of the Apiaceae or Umbelliferae family (both names are allowed by the International Code of Botanical Nomenclature). This family comprises unusually aromatic plants with hollow stems, including the cumin, parsley, carrot, parsnip, dill, caraway, fennel, and other relatives. Tsugas are medium-size to large evergreen trees, ranging up to 65 meters tall, with a conical to irregular crown, with the latter occurring especially in some of the Asian species. The leading shoots generally droop. The bark is scaly and commonly deeply furrowed, with the color ranging from gray to brown, and often reddish brown or purplish. The branches stem horizontally from the trunk and are usually arranged in flattened sprays that bend downward. Spur shoots, which are present in many gymnosperms, are absent to moderately developed (Earle 2006). The young twigs as well as the distal portions of stem are flexuous and pendent. The stems are rough due to peg-like projections that persist after the leaves fall. (Taylor 1993). The leaves are flattened to slightly angular and range in size from 8 to 40 millimeters (mm) in length and 1.5 to 3 mm in width. They are borne singly and are arranged either pectinately on the stem or rarely radially. Towards the base, the leaves narrow abruptly to a petiole that is set on a forward-angled, twig-like projection. The petiole is twisted at the base so that it is almost parallel with the stem. Sheaths are absent. The apex is either notched, acute, or rounded. The undersides have two white stomatal bands (in T. mertensiana they are inconspicuous) separated by an elevated midvein. The upper surface of the leaves lack stomata, except for in the subgenus Hesperopeuce. They have one resin canal that is present beneath the single vascular bundle. When sprouting from seed, four to six cotyledons are present. The buds persist into winter and are ovoid or globose, usually rounded at the apex and not resinous (Wu and Raven 1999). The cones are borne on year-old twigs and are small, ranging in length from 15 to 35 mm long. In the subgenus Hesperopeuce, they are larger at 35 to 70 mm in length. The pollen cones grow solitary from lateral buds, though sometimes they occur in clustered umbels from a single bud. They are ovoid, globose, or ellipsoid in shape and brown in color. The pollen itself has a saccate, ring-like structure at its distal pole, and rarely this structure can be more or less doubly saccate. The seed cones are terminal or rarely lateral, occurring on second year branchlets. They occur solitary and are pendulous, though they are also erect in some species. They are ovoid-globose, oblong, or oblong-cylindric in shape and are sessile or at least very nearly so. Maturation occurs within the first year and the seeds are shed shortly thereafter, or they may persist for several years. The seed scales are thin, leathery, and persistent. They vary in shape and lack an apophysis and an umbo. The bracts are included and small, and they rarely have a somewhat protruding apical cusp. The seeds are small, from 2 to 4 mm long, and winged, with the wings being 8 to 12 mm in length. They also contain small adaxial resin vesicles. They germinate epigeally (Taylor 1993). Another species, bristlecone hemlock, first described as Tsuga longibracteata, is now treated in a distinct genus Nothotsuga; it differs from Tsuga in the erect (not pendulous) cones with exserted bracts, and male cones clustered in umbels, in these features more closely allied to the genus Keteleeria. Mountain hemlock, T. mertensiana, is unusual in the genus in several respects. The leaves are less flattened and arranged all round the shoot, and have stomata above as well as below, giving the foliage a glaucous color; and the cones are the longest in the genus, 35-70 mm long and cylindrical rather than ovoid. Some botanists treat it in a distinct genus as Hesperopeuce mertensiana, though it is more generally only considered distinct at the rank of subgenus. Conium is a genus of two species of perennial herbaceous flowering plants in the family Apiaceae, native to Europe and the Mediterranean region (C. maculatum), and to southern Africa (C. chaerophylloides). 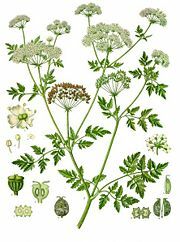 By far the most familiar species is Conium maculatum, known both as hemlock and as poison hemlock. It is noted for its toxicity. It is a herbaceous biennial plant that grows between 1.5–2.5 meters tall, with a smooth green stem, usually spotted or streaked with red or purple on the lower half of the stem. The leaves are finely divided and lacy, overall triangular in shape, up to 50 cm long and 40 cm broad. The flowers are small, white, clustered in umbels up to 10–15 cm across. The plant is often mistaken for fennel, parsley, or wild carrot (with disastrous results if consumed), although the characteristic stem hairs of the wild carrots are missing. The Conium root is fleshy, white and often unbranched and can be mistaken for parsnip. When crushed, the leaves and root emit a rank, unpleasant odor often compared to that of parsnips. Poison hemlock flourishes in the spring, when most other forage is gone. All plant parts are poisonous but once the plant is dried, the poison is greatly reduced, however not gone completely. Hemlock is also known as "poison parsley" or "spotted parsley." Conium contains the alkaloids coniine, N-methylconiine, conhydrine, pseudoconhydrine, g-coniceïne, and atropine. The most important and toxic of these is coniine. Coniine is a neurotoxin that disrupts the workings of the central nervous system and is toxic to people and all classes of livestock. Conium maculatum has been introduced and naturalized in many other areas, including much of Asia, North America, and Australia. 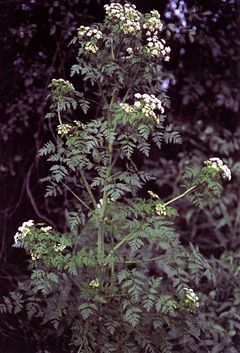 Poison hemlock is often found on poorly drained soils, particularly near streams, ditches, and other surface water. Conium is used as a food plant by the larvae of some Lepidoptera species including Silver-ground Carpet. Poison hemlock has been used as a sedative and for its antispasmodic properties. It was also used by Greek and Persian physicians for a variety of problems, such as arthritis. However, it was not always effective as the difference between a therapeutic and a toxic amount is very slight. Overdoses can produce paralysis and loss of speech being followed by depression of the respiratory function and then death. Poison hemlock is sometimes confused with water hemlocks in the related genus Cicuta, but are readily distinguished by the less finely divided leaves of the latter. The leaf veins of poison hemlock also run through the tips of the teeth, but those of the water hemlock run through the notches in between the teeth. The poison hemlock's root is long, white, and fleshy. It is unbranched and can usually be distinguished from the water hemlock's roots that are made up of several tubers. Members of the Circuta genus are also highly poisonous and can also be mistaken for parsnip due to its clusters of white tuberous roots; this is an often fatal error. A single bite of the root (which has the highest concentration of cicutoxin) can be sufficient to cause death. Circuta also is called cowbane because livestock are often the worse affected. Although many have questioned whether this is a factual account, careful attention to Plato's words, modern and ancient medicine, and other ancient Greek sources point to the above account being consistent with Conium poisoning (Bloch 2001). Bloch, E. 2001. Hemlock poisoning and the death of Socrates: Did Plato tell the truth?. Journal of the International Plato Society 1. Retrieved November 22, 2007. (A version of this article was also printed in T. C. Brickhouse and N. D. Smith (editors), The Trial and Execution of Socrates: Sources and Controversies. New York: Oxford University Press. 2002. ISBN 9780195119800. Earle, C. J. 2006. Christopher J. Tsuga. The Gymnosperm Database. Retrieved November 22, 2007. Plato. 1990. Plato, Euthyphro, Apology, Crito, Phaedo. Perseus. Cambridge, MA: Harvard University Press. (trans. Loeb Classical Library). Retrieved November 22, 2007. Royal Botanical Garden Edinburgh. 2007. Flora Europaea: Conium. Royal Botanical Garden Edinburgh. Retrieved November 22, 2007. Taylor, R. J. 1993. Tsuga. Flora of North America. Retrieved November 22, 2007. United States Department of Agriculture (USDA), Agricultural Research Service (ARS), National Genetic Resources Program. 2007. GRIN Species Records of Conium. USDA ARS GRIN (online database). Retrieved November 22, 2007. Wu, Z.-Y., and P. H. Raven. 1999. Tsuga. Flora of China. Retrieved November 22, 2007. This page was last modified on 2 April 2008, at 08:35.